Toumai Air Tchad Toumaï Air Chad is the national flag carrier airline of Chad. It operated domestic services within Chad as well as scheduled international services to other African nations from its main base at N'Djamena International Airport. International flights appeared to have been operated by primarily South African crews, but there is no recent confirmation of this, and flights were grounded in July 2012 because of safety concerns. 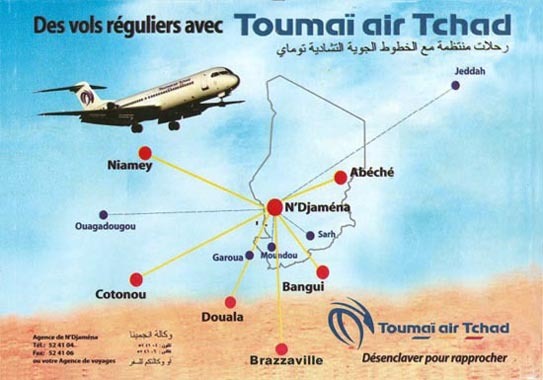 Scheduled flights appear to be suspended, but recent reports (September 2013) indicate that Toumaï Air Tchad had resumed limited operations on Hajj charter flights.